The meatball snack food stalls in Thailand are to many Thai people what hot dog vendors in the U.S. are to Americans. 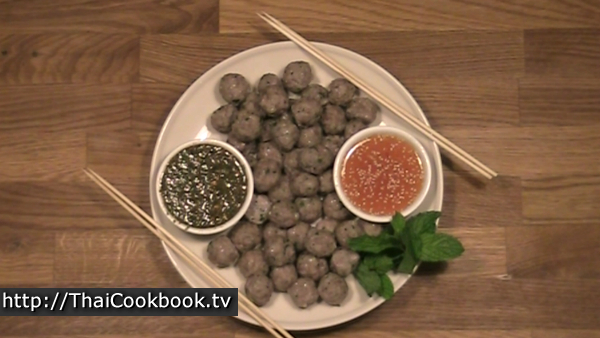 Meatballs are one of our most popular and easily found street food snacks. As with hot dogs, it is not likely that you will find someone selling their own homemade meatballs. 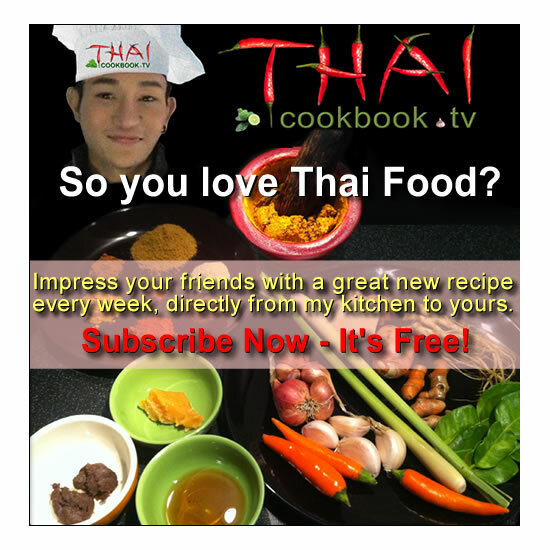 With this recipe you can enjoy the delicious and very authentic flavor of Thai meatballs wherever you are. They are quite easy to prepare with your choice of ground pork, chicken, or beef, and we serve them up with two of our popular dipping sauces. What's in our Meatball Snacks. 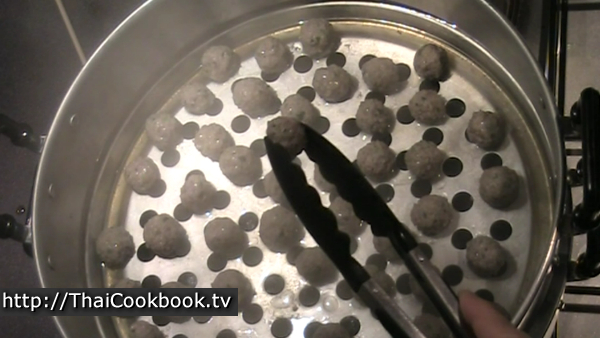 How we make our Meatball Snacks. 1) Prepare a sauce by heating fish sauce and sugar until blended. 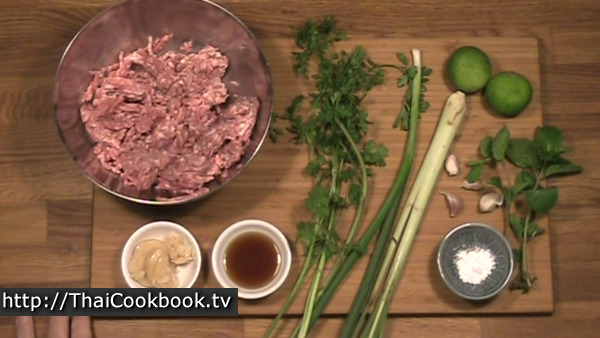 Add the sauce to the ground meat, with chopped cilantro, lemongrass, mint, garlic, green onion, white pepper, and tapioca flour. Let stand for 15 minutes. 2) Prepare the Spicy Mint & Cilantro Sauce by combining chopped cilantro, mint, and green onion with soy sauce, lime juice, sesame oil, chili flakes, and sugar. 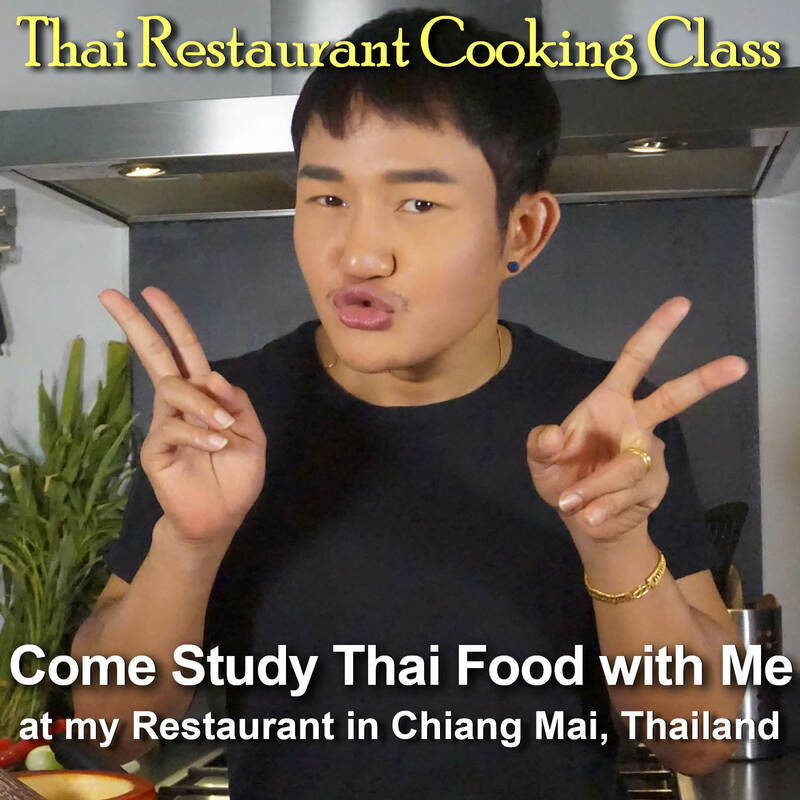 3) Prepare the Sweet Sesame Sauce by combining lime juice with Thai sweet chili sauce, sesame oil, and white sesame seeds. 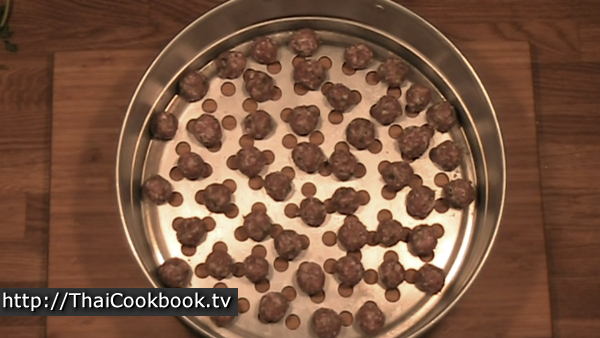 4) Roll 1 teaspoon of the meat mixture each into little balls. Place them in a steamer and cook on high for 5 minutes. 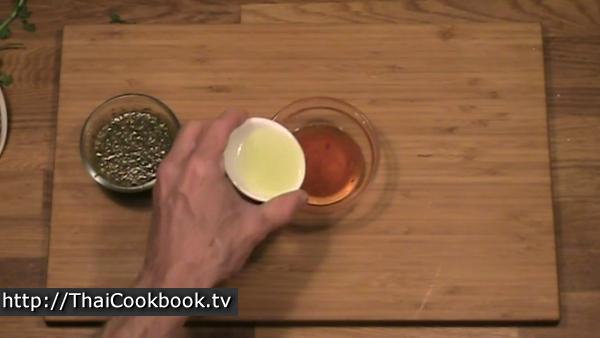 Serve warm with the two sauces. 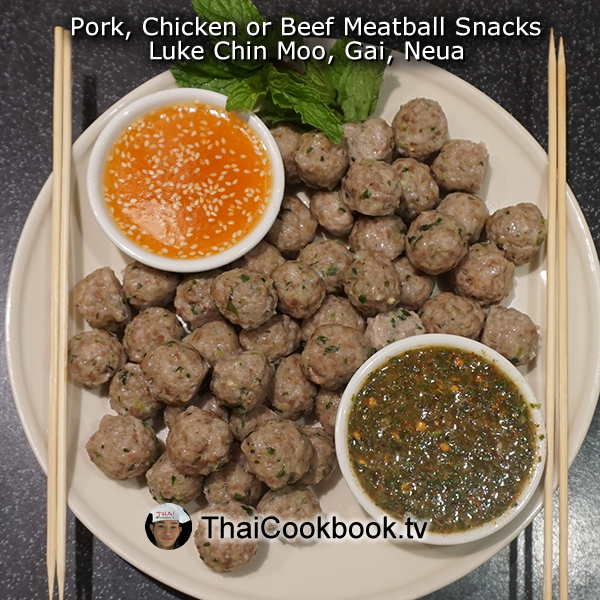 In Thailand our meatballs are usually made with ground pork, but you can also use chicken or beef. Start by making a sauce from the fish sauce and sugar. In a small pan heat the fish sauce and sugar slowly until it starts to bubble. Stir continuously until they melt together to make a sticky sauce. Remove from the heat and allow it to cool completely. 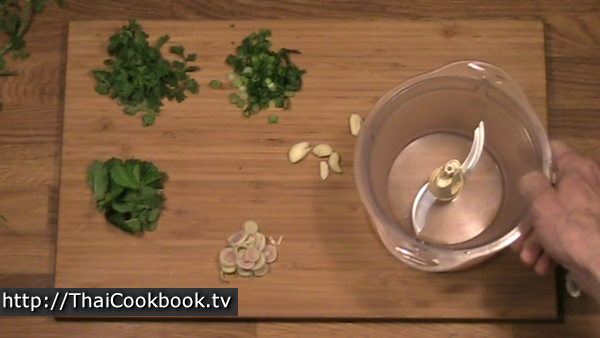 Cut the mint leaves, cilantro, lemongrass, green onion, and garlic into equal amounts of about 1 tablespoon each. Use a vegetable chopper or chop it by hand until very fine. 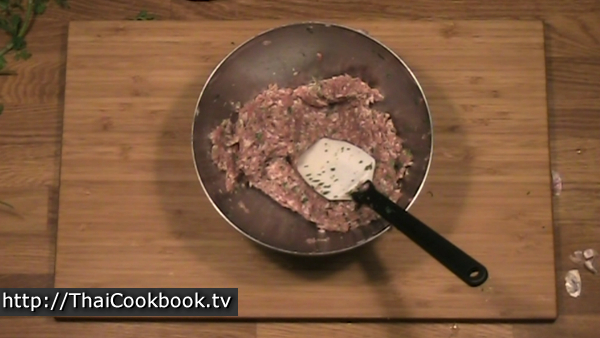 After the fish sauce and sugar has cooled completely, add it to your ground meat. Next add the chopped herbs, tapioca flour, and white pepper. Mix it all together well and allow it to sit for about 15 minutes. 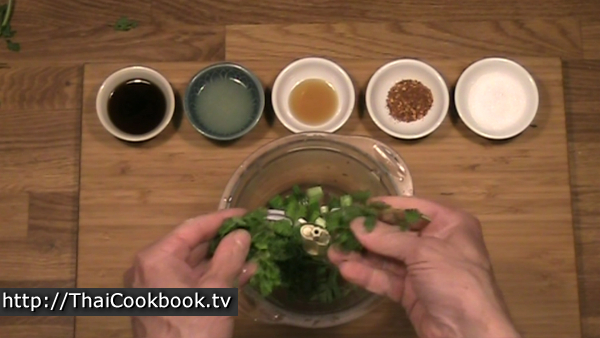 Prepare the Spicy Mint & Cilantro Sauce by combining the cilantro, mint, green onion, soy sauce, lime juice, sesame oil, chili flakes, and sugar together. Chop on high in your chopper until very fine. 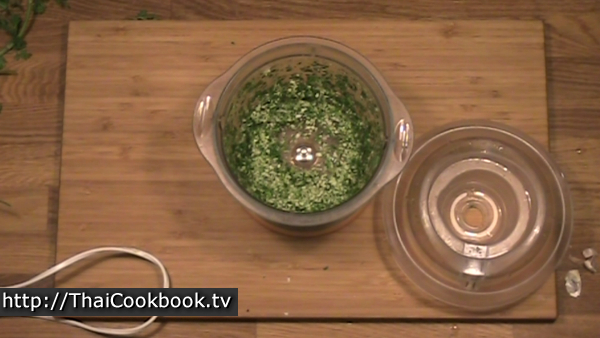 If doing it by hand chop the herbs very fine, then stir in the other ingredients until well blended. 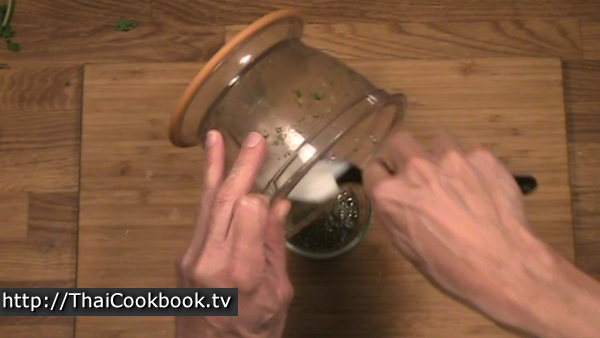 Pour the mixture into a small bowl for dipping. 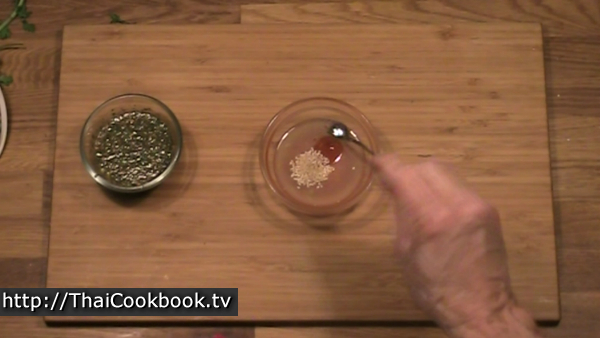 Prepare the Sweet Sesame Sauce by stirring the lime juice together with the sweet chili sauce. Add the sesame oil and the sesame seeds. Whisk together lightly until well mixed and pour into a serving bowl. 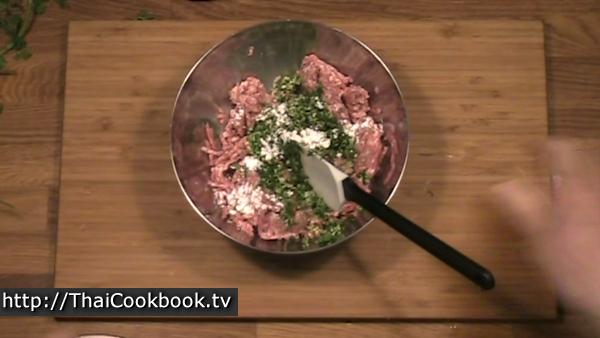 Put about 1 teaspoon of the meat mixture in your hands and roll it around to form a very small meatball. For best results work to get all the balls the same size. With this amount of meat you should get about 50 balls. 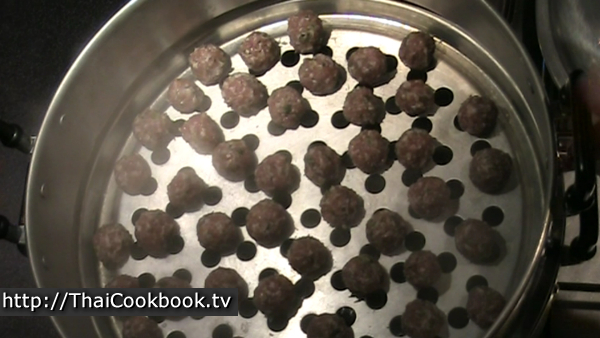 As you roll them, go ahead and lay the balls in your steamer tray with a little space all around. Boil the water in your steamer, then add the steaming tray, cover it, and cook on high heat for about 5 minutes. Check after 5 minutes. The balls should be already firm. Check one to make sure they are cooked through, then remove from the steam promptly. Do not overcook. After cooling slightly, place them on a plate with both sauces and some mint or cilantro as a garnish. Serve and eat with satay or hot dog sticks for an authentic flair.